Most of the Low Countries had come under the rule of the House of Burgundy and subsequently the House of Habsburg. In 1549 Holy Roman Emperor Charles V issued the Pragmatic Sanction, which further unified the Seventeen Provinces under his rule. Charles was succeeded by his son, King Philip II of Spain. 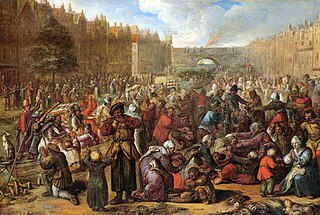 In 1568 the Netherlands, led by William I of Orange, revolted against Philip II because of high taxes, persecution of Protestants by the government, and Philip's efforts to modernize and centralize the devolved-medieval government structures of the provinces. This was the start of the Eighty Years' War. Charles V was Holy Roman Emperor (1519–1556), King of Spain and ruler of the Spanish Empire, Archduke of Austria, and ruler of the Habsburg Netherlands (1506–1555). The Spanish conquest of the Aztecs and Incas, and the German colonisation of Venezuela both occurred during his reign. Charles V revitalized the medieval concept of the universal monarchy of Charlemagne and travelled from city to city, with no single fixed capital: overall he spent 28 years in the Habsburg Netherlands, 18 years in Spain and 9 years in Germany. After four decades of incessant warfare with the Kingdom of France, the Ottoman Empire, and the Protestants, Charles V abandoned his multi-national project with a series of abdications between 1554 and 1556 in favor of his son Philip II of Spain and brother Ferdinand I of Austria. The personal union of his European and American territories, spanning over nearly 4 million square kilometres, was the first collection of realms to be defined as "the empire on which the sun never sets". The Act of Abjuration is the declaration of independence by many of the provinces of the Netherlands from the allegiance to Philip II of Spain, during the Dutch Revolt. The "French Fury" was a failed attempt by Francis, Duke of Anjou, to conquer the city of Antwerp by surprise on 17 January 1583. Henry III was King of France from 1574 until his death and also King of the Polish-Lithuanian Commonwealth from 1573 to 1575. Henry was the thirteenth king from the House of Valois, the sixth from the Valois-Orléans branch, the fifth from the Valois-Orléans-Angoulême branch, and the last male of his dynasty. During the Anglo-French war (1778), the internal territory was divided into two groups: the Patriots, who were pro-French and pro-American, and the Orangists, who were pro-British. The Republic of the United Provinces faced a series of republican revolutions in 1783–1787. During this period, republican forces occupied several major Dutch cities. Initially on the defence, the Orangist forces received aid from Prussian troops and retook the Netherlands in 1787. The republican forces fled to France, but then successfully re-invaded alongside the army of the French Republic (1793–95), ousting stadtholder William V, abolishing the Dutch Republic, and replacing it with the Batavian Republic (1795–1806). 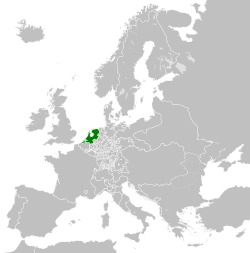 After the French Republic became the French Empire under Napoleon, the Batavian Republic was replaced by the Napoleonic Kingdom of Holland (1806–1810). Republicanism in the Netherlands is a movement that strives to abolish the Dutch monarchy and replace it with a republic. The popularity of the organised republican movement that seeks to abolish the monarchy in its entirety has been suggest to be a minority among the people of the Netherlands, according to opinion polls. On the other hand, there has shown to be political and popular support in the Netherlands for reducing the political powers and the subsidies of the royal house. The Prussian invasion of Holland was a Prussian military campaign in September–October 1787 to restore the Orange stadtholderate in the Dutch Republic against the rise of the democratic Patriot movement. The Flanders Campaign was conducted from 6 November 1792 to 7 June 1795 during the first years of the French Revolutionary Wars. A Coalition of states representing the Ancien Régime in Western Europe – Austria, Prussia, Great Britain, the Dutch Republic, Hanover and Hesse-Kassel – mobilised military forces along all the French frontiers, with the intention to invade Revolutionary France and end the French First Republic. The radicalised French revolutionaries, who broke the Catholic Church's power (1790), abolished the monarchy (1792) and even executed the deposed king Louis XVI of France (1793), vied to spread the Revolution beyond France's borders, by violent means if necessary. The free trade spirit of the time was augmented by the development of a modern, effective stock market in the Low Countries. The Netherlands has the oldest stock exchange in the world, founded in 1602 by the Dutch East India Company, while Rotterdam has the oldest bourse in the Netherlands. The Dutch East-India Company exchange went public in six different cities. Later, a court ruled that the company had to reside legally in a single city, so Amsterdam is recognized as the oldest such institution based on modern trading principles. While the banking system evolved in the Low Countries, it was quickly incorporated by the well-connected English, stimulating English economic output. There was an eighth province, the County of Drenthe, but this area was so poor it was exempt from paying federal taxes and as a consequence was denied representation in the States General. Each province was governed by the Provincial States, the main executive official (though not the official head of state) was a raadspensionaris . In times of war, the stadtholder, who commanded the army, would have more power than the raadspensionaris. The framers of the U.S. Constitution were influenced by the Constitution of the Republic of the United Provinces, as Federalist No. 20, by James Madison, shows. Such influence appears, however, to have been of a negative nature, as Madison describes the Dutch confederacy as exhibiting "Imbecility in the government; discord among the provinces; foreign influence and indignities; a precarious existence in peace, and peculiar calamities from war." Apart from this, the American Declaration of Independence is similar to the Act of Abjuration, essentially the declaration of independence of the United Provinces,  but concrete evidence that the latter directly influenced the former is absent. The Generality Lands, Lands of the Generality or Common Lands were about one fifth of the territories of the United Provinces of the Netherlands, that were directly governed by the States-General. Unlike the seven provinces Holland, Zeeland, Utrecht, Guelders, Overijssel, Friesland and Groningen, these territories had no States-Provincial and were not represented in the central government. From an economic point of view, they were exploited with heavy taxes and levies. As one author puts it: "Back in the Dutch lap, these so-called Generality countries were for a long time governed as a sort of internal colonies, in which Catholics were seen as second-class citizens." The States General of the Batavian Republic was the name for the Dutch government between January, 1795 and March 1796. It was nominally the same as the States-General of the Dutch Republic, the predecessor of the Batavian Republic, as the old constitution, the Union of Utrecht remained in place till a new National Assembly of the Batavian Republic was seated after a general election, under universal manhood suffrage. As under the old constitution the States of the seven provinces remained the basis for representation in the States-General. However, those States were in most cases replaced by new representative bodies, like the Provisional Representatives of the People of Holland.The places of the members of the previous Orangist regime as representatives of the Seven Provinces were now taken by members of the Patriot party. The presidents of the States-General, both under the old and the new Republic, were acting as head of state for their term in office as president. A referendum on the constitution of the Batavian Republic was held on August 8, 1797. The draft constitution was rejected, eventually culminating in a coup d'état. The Second Stadtholderless Period or Era is the designation in Dutch historiography of the period between the death of stadtholder William III on March 19, 1702 and the appointment of William IV as stadtholder and captain general in all provinces of the Dutch Republic on May 2, 1747. During this period the office of stadtholder was left vacant in the provinces of Holland, Zeeland, and Utrecht, though in other provinces that office was filled by members of the House of Nassau-Dietz during various periods. During the period the Republic lost its Great-Power status and its primacy in world trade, processes that went hand-in-hand, the latter causing the former. Though the economy declined considerably, causing deindustralization and deurbanization in the maritime provinces, a rentier-class kept accumulating a large capital fund that formed the basis for the leading position the Republic achieved in the international capital market. A military crisis at the end of the period caused the fall of the States-Party regime and the restoration of the Stadtholderate in all provinces. However, though the new stadtholder acquired near-dictatorial powers, this did not improve the situation. ↑ Ertl 2008, p. 217. ↑ Cook, Chris; Broadhead, Philip (2006). "Population, Urbanisation and Health". The Routledge Companion to Early Modern Europe, 1453–1763. Abingdon and New York. p. 186. ↑ Mijnhardt, Wijnand W. (2010). "Urbanization, Culture and the Dutch Origins of the European Enlightenment". BMGN: Low Countries Historical Review . 125 (2–3): 143. doi:10.18352/bmgn-lchr.7118. ↑ Arrighi, G. (2002). The Long Twentieth Century. London, New York: Verso. p. 47. ISBN 1-85984-015-9. ↑ James Madison (11 December 1787). Fœderalist No. 20. ↑ Barbara Wolff (29 June 1998). "Was Declaration of Independence inspired by Dutch?". University of Wisconsin–Madison . Retrieved 14 December 2007. ↑ "Unie van Utrecht – Wikisource". nl.wikisource.org. 1 2 Israel, J. I. (1995). The Dutch Republic: Its Rise, Greatness, and Fall 1477–1806. Oxford: Clarendon Press. ISBN 0-19-873072-1. ↑ van Maanen, R. C. J. (2003). Leiden: de geschiedenis van een Hollandse stad. II. 1574–1795. Stichitng Geschiedschrijving Leiden. ISBN 90-806754-2-3.